The upper right lateral incisor was tipped at an angle which made it impossible to get it parallel with the other telescope crowns. Therefore it was restored with a bonded porcelain crown and the palatal side was made parallel with the other telescopes. When cementing the primary inner crowns, if any one crown does not sit correctly it will spoil the fit of the prosthesis. It is therefore worth placing the primary inner crowns in the prosthesis so they are held in the correct orientation and, if possible, cementing them all at the same time, to be assured that they all sit correctly and do not spoil the fit. 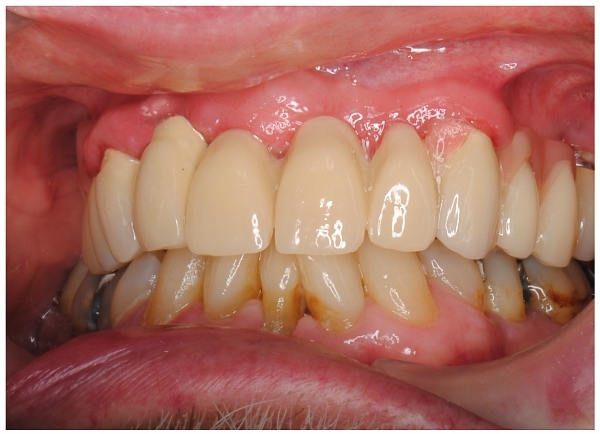 In this case, we cemented the bonded crown on tooth 22 separately because the angulation of this tooth and the path of insertion made it impossible to cement it at the same time as the other crowns. The prosthesis should be carefully smeared with Vaseline® so that any excess cement will not cement the prosthesis in, will not foul the TK1 attachment screws and can easily be removed from the prosthesis. Fig. 18: The tiny screws are easy to adjust with a small screwdriver and give strength to the friction fit of the prosthesis. 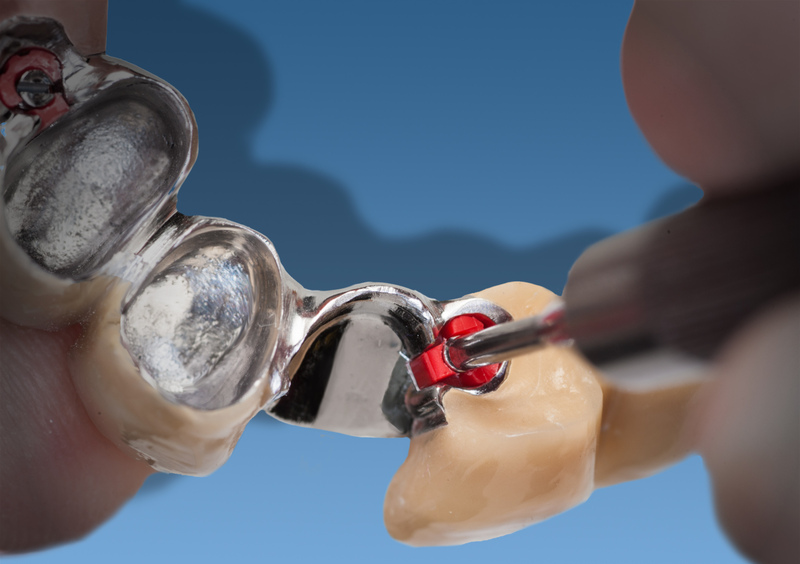 After cementing the primary crowns, we initially fit the prosthesis loosely, so the patient can get used to fitting and removing it themselves. A few days later at a follow-up appointment, we adjust the screws in the TK1 attachment to get the required tightness of fit. Fig. 20: No clasps necessary and with a full arch prosthesis, no problems with colour matching. 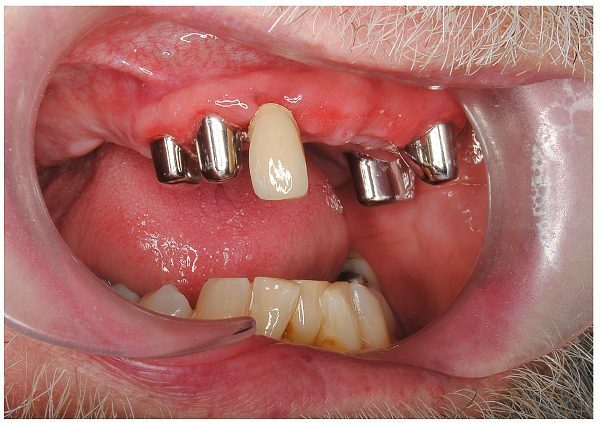 In this case we went straight from the failing fixed bridges to the telescope crown retained prosthesis. This put a lot of pressure on the dentist to fix whatever we found underneath the bridges and make a good temporary bridge at one long appointment. I now think that in some cases it might be worth removing the old bridges and having a temporary denture made and fitted. This would allow a better assessment of the abutment teeth before we commit to a treatment plan (some teeth might be worse than expected and be un-repairable and spoil the treatment plan). More appointments can then be allocated to treat the abutment teeth at a convenient time. 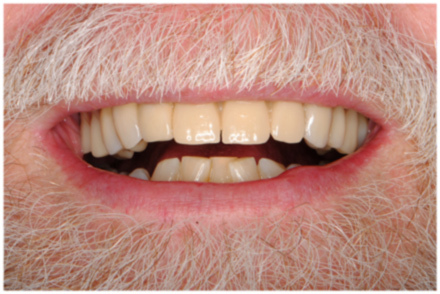 Also, if a patient has had to tolerate a temporary acrylic denture for a while then they appreciate the benefits of the superior telescope crown retained prosthesis (should this term be capitalized and/or hyphenated? Need to be consistent within document) much more. Initially I was worried about working with a dental technician who was geographically so far away from our dental practice in England. In reality, it was no problem at all. We regularly post work to dental technicians in England, so it was just as easy to post the work to Ulrich at his TEETH ‘R’ US lab in Germany. The post takes just a day or two more to get to Germany and back so we just allowed slightly longer between appointments than usual. With modern communications it was easy to talk things through with Ulrich and he was very helpful. He kept us informed on how the work was progressing, when he would be returning the work etc. so we were reassured and relaxed about the treatment and knew the work would be ready for the patient’s next appointment. The quality of the lab work was excellent; it fitted perfectly and looked beautiful. When embarking on this sort of treatment you want to be confident that it is going to fit and that the patient will be happy. With this in mind I can confidently recommend Ulrich for this type of work. On a practical note when working with a German laboratory: allow some extra time and cost for postage; there will be a small bank charge on the required electronic payment for the conversion Pounds to Euros; small shifts occur in exchange rates between the time of the initial estimate for treatment to the final invoice. Though these costs are minor relative to the overall work, factor them in when giving the initial quote to the patient before treatment begins. 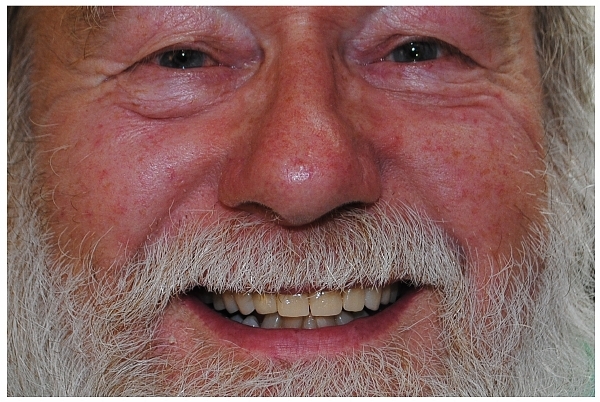 Increasingly we are seeing older patients who have lived through the “Drill and Fill” years of dentistry, who have heavily restored mouths and consequently a lack of good tooth structure to work with. As their teeth start to fail the decision on how to restore their mouths can be increasingly difficult. 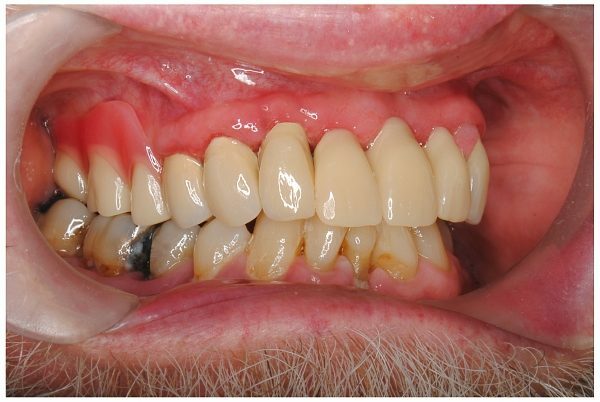 I find that a lot of these patients do not want to wear a denture and either cannot afford the cost of implants or do not like the idea of the invasive treatment involved with implant treatment. All general dental practitioners will have the skills necessary to provide this treatment, so this may save having to refer to an implant specialist. Obviously case selection is very important, but I feel that a telescope crown retained prosthesis can be a useful alternative option to offer some of these patients. In the UK this is an option that we often forget to offer. As the cost of dental treatment increases, patients want to know how long restorations will last, so they can assess if they are going to get good value for their money. As clinicians we know that it is almost impossible to guarantee any dental work and heavily restored teeth tend to be the most unreliable. For me, the fact that the telescope crown retained prosthesis is easily removed means that I am confident that I can sort out a problem with an abutment tooth underneath. Also, if there are several abutment teeth available to accept the telescope crowns, then if one tooth fails and we have to extract it, then usually we do not lose the whole prosthesis. 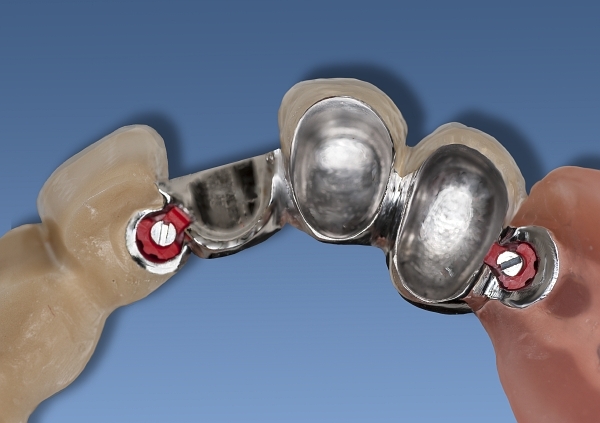 The prosthesis will usually hold pretty well with one less abutment tooth. So whilst I cannot guarantee that the patient will not have a problem, I am much more confident that I will be able to fix it if it happens. 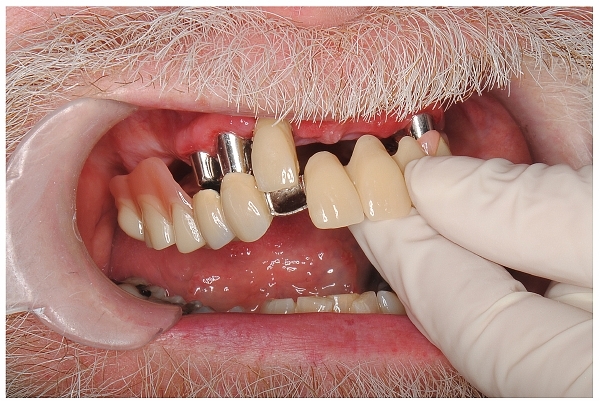 I also think that the telescope crown retained prosthesis can be a better transition towards a full denture. Dr Bernard Martin Mayston BDS Lond. 1985 is the principal/owner of Diss Dental Care Centre. Dr Mayston has been caring for his patients in Diss and its surrounding area for over 28 years. dissdentalcarecentre@hotmail.co.uk Ulrich Heker is the owner-manager of Ulrich Heker Dental Laboratory founded in 1996 with the strap line TEETH ‘R’ US.